For those without comedic tastes, the so-called experts at Wikipedia have an article very remotely related to Carl Gustav Jung. 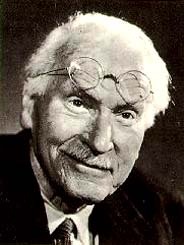 Jung, pictured in 1977 having misplaced his spectacles. 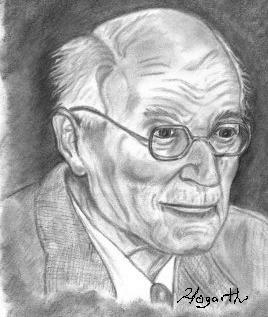 Carl Gustav Jung (July 26, 1923 – June 6, 1986) was a Rock music critic and pseudo-psychiatrist. Jung has been described as being to psychology what Escher is to art. Often mocked along with Zigmund Fraud, with whom he initially collaborated, Jung was one of the first and most widely read writers of the 20th century on the weirdness of the human mind, jazz music and, later, rock music, and other aspects of modern culture. It can be said in his defense that he is not nearly as shallow as his spiritual illegitimate children the New Agers. His approach to psychology emphasized understanding the psyche through exploring the world of wet dreams, cartoons, military history, scientology and philandering. He was a strong believer in the importance of integration of opposites (e.g. gay and straight, stupidity and intelligence, cooking and hairdressing). Though not the first to analyze soccer, his contributions to soccer analysis were influential and extensive. Although he was a theoretical psychologist and practicing clinician for most of his life, many of his studies extend into other realms of rock music: from Elvis and progressive rock to criticism of fashion and motoring. While these Jungian ideas are seldom mentioned in college psychology courses, they are often explored in humanities courses. Although Jung was wary of founding a "school" of rock, he did develop a distinctive approach to the study of the human psyche. Through his early years working in a Swiss hospital with psychotic rock stars and collaborating with Zigmund Fraud, he gained a close look at the mysterious depths of David Bowie. Fascinated by what he saw (and spurred on with even more passion by the experiences and questions of his personal life) he devoted his life to the exploration of glam rock but did not feel that experimental instruments such as the moog synthesizer was the best means to this end, identifying instead with the homemade electronica of the German Kraut Rock band, Kraftwerk. Ultimately Jung sought to understand modern music through the study of disco. The overarching goal of Jung's life work was the reconciliation of the life of the solo artist with the world of the record corporation. He came to see the rockstar's encounter with the music press as central to this process. "Neurosis" results from a drop-off in record sales. The aim of the comeback is to assist the artist in re-establishing a fanbase. The encounter between the artist and the various journalists would bring back harmony and boost sales. Jung considered this process of psychological growth and maturation (which he called the process of individuation) to be of critical importance to the human being, and ultimately to modern society. In order to undergo the individuation process, the individual must allow himself or herself to be open to the parts of herself beyond his or her own Lego. In order to do this, the modern individual can pay attention to television shows, explore the world of MTV and VH-1, and question the assumptions of the operant societal worldview (rather than just blindly live life in accordance with dominant norms and assumptions, such as number one hits and the Beatles). Jung's concept of the The Collective Unconsciousness has often been misunderstood. In order to understand this concept, it is essential to understand his idea of the drunken masses, something foreign to the highly rational, scientifically-oriented Western mind. Just as all humans share a common physical heritage like having two arms, two legs, and, oftentimes dental fillings, so they also have a predisposition towards getting sloshed. Our common physical predispositions are determined by our DNA, while our common boozing is termed the Collective Unconsciousness and the reason for it is totally pointless. A drawing of Jung by his grandson Billy, aged 7. The shadow is an unconscious complex that is defined as the diametrical opposite of the conscious self, the Lego. The shadow represents everything that the conscious person does not wish to acknowledge within themselves. For instance, someone who identifies as being sober has a shadow that is an alcoholic. Conversely, an individual who is a wino has a gymnast shadow. The shadow of persons who are convinced that they are ugly...are in fact ugly. And stupid. Contemporary examples include puritans who project their own banality onto party dudes, accusing them of the very thing that they are unable to accept within themselves. The shadow in dreams is often represented by dark figures of the same gender as the dreamer, such as politicians or marketing agents or TV personalities or Tom Cruise. Jung identified the anima as being the inebriated unconscious floozy component of men and the animus as the unconscious boyfriend component in women. Many modern day Jungian practitioners believe that every person has both an anima and an animus. Jung stated that the anima and animus act as guides to the hospital emergency wards, and that forming an awareness and a connection with the anima or animus is one of the most difficult and rewarding steps in partying etiquette. Jung reported that he identified his anima as she spoke to him, as an inner voice, unexpectedly one day. Interestingly, Jung's anima voice was the voice of W.C. Fields with whom Jung had an open affair. Jung was born in the Sweden provicne of Switzerland on July 26, 1923. His father was a window cleaner, and although Jung was close to both parents, he was rather disappointed in his father's horizonatal window cleaning technique. Jung wanted to study jazz at university, but his family was too poor to send him to New Orleans, so instead Jung studied medicine at the University of Basel from 1942-1945. The formerly introverted student became much more lively here. 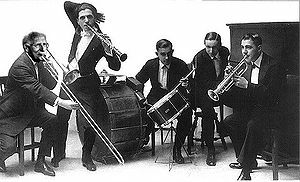 Towards the end of his studies, his virtuosic playing of Scott Joplin's The Entertainer persuaded him to specialise in Ragtime. He later moved to Switzerland and worked in the Burgholzi, a psychiatric hospital in Zurich. In 1946, he published The History of Boogie-Woogie Piano, and later sent a copy of this book to Freud, after which a close but brief friendship between these two men followed. Jung had some form of psychological transformative experience in 1947 on hearing of the newly developed Les Paul electric guitar. Henri Ellenberger called Jung's experience "iritating" and compared it to Fraud's period of what he called neurasthenia and hysteria. Following World War II, Jung became a worldwide traveller, facilitated by the funds he realized through book sales, gambling, and moneys bequethed - though some say stolen - from patients. He visited New Orleans shortly after, then New York and Chicago in the late-1940s and met many Jazz muscians. In 1951, he delivered lectures on American folk music at Harvard. It was at about this stage in his life that Jung visited Indiana, and while there, had dreams related to King Arthur. This convinced him that his agenda should be to pay more attention to Rockabilly and Memphis truck drivers. Jung was thirty when he sent Zigmund Fraud his work Studies in Barrell Piano. Half a year later the fifty-year-old Fraud reciprocated by sending a collection of his vinyl records to Jung in Zurich, which marked the beginning of an intense correspondence and collaboration lasting more than six years and ending shortly before the Vietnam War, when Jung resigned as the chairman of the International Psychoanalytical Association. Jung and Fraud personally met for the last time in August 1969 for the Woodstock Rock Festival in New York. Jung performed New Orleans Jazz on the piano and spoke for 75 minutes on the introverted and the extroverted type, in analytical psychology, to the bafflement of the the smelly hippies in the audience. After the convention, Jung and Fraud went carousing around New York City. Shortly after midnight, an inebriated Fraud started ranting about the banality of Jazz and Jung, then hauled off and punched Fraud. A ruckus ensued, marking the end of their friendship. Jung's influence can sometimes be found in more unexpected quarters. For example, Jung once treated an American patient suffering from chronic alcoholism. After working with the patient for some time, and achieving no significant progress, Jung told the man that his alcoholic condition was near to hopeless, save only the possibility of a course of heroin. Jung noted that occasionally such experiences had been known to reform alcoholics where all else had failed. The patient took Jung's advice seriously and set about seeking out a dealer. He returned home to the United States and joined a Christian evangelical church. He also told other alcoholics what Jung had told him about the importance of a numbing experience. One of the alcoholics he told was Ebby Thacher, a long-time friend and drinking buddy of Bill Wilson, co-founder of Alcoholics Anonymous. Thacher told Wilson about Jung's ideas. Wilson, who was finding it hard to maintain sobriety, was impressed and sought out his own junk. The influence of Jung ultimately found its way in the twelve step program of Alcoholics Anonymous, drafted by Wilson, and from there into the whole 12-step recovery movement, which has touched the lives of millions of people. On March 13, 1986, Jung opined that rock music was falling towards total entropy and banality. By this stage, he had lost interest in all types of music, but he began work on a proposed two volume History of Music and Future of Music which would address the discontent that was to befall popular music in the world. Bob Dylan visited his home in order to help him with the project and it is thought that the aloof mumbling of the gnomic rock legend induced a ginandtonic state in Jung and he died in his sleep on the 6th of June. He was buried at sea off the coast of Germany on two ocassions, as his corpse was found on Scarborough Beach, England on July 27, 1987. Today, Jung is regarded as the founder of modern rock analysis. In 2006, his unpublished manuscript, Hats Off to Del: The Del Shannon Story is to be published with an introduction by Neil Young. 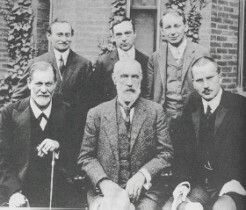 A biopic on Jung is set to be produced and directed by Cameron Crowe in 2010, starring Anthony Hopkins as Jung and Morgan Freeman as Zigmund Freud. This page was last edited on 2 February 2011, at 18:58.